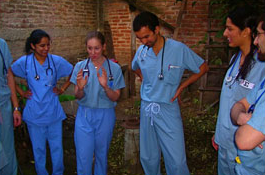 If you are a Feinberg School of Medicine student in good standing, you are encouraged to apply for funding to travel and study in under-resourced countries any time during your four years of education at Northwestern University. Primary care is what we think about when we think of medicine - it is medicine. And it is what people need. Developing these relationships and spending time with Kenyans was the most rewarding aspect of this trip. We were able to talk to the residents about their path to medical school and then residency and their aspirations as physicians. While we are trained halfway around the world from one another, our goals are still strikingly similar - be a competent physician who can help treat illness and care for people. There are so many people in the world that we can help and that we should help. It was a very good experience to see them and realize that I can make a difference in their lives. I have always valued primary care. It’s the first line of medical care, ideally able to treat most acute and chronic conditions. This trip affirmed that reality as our attending physicians handled every patient’s problem effectively with their broad-based medical training. I now have a greater understanding of how important local infrastructure and an understanding of a culture is before effective healthcare can be delivered. When there are not lab tests, imaging studies and culture results to tell us what is going on you are brought back to the true practice of medicine – LISTENING to your patient. I greatly appreciate the help of the GHI in allowing me to participate in this trip - it has greatly increased my knowledge of, and enthusiasm for, primary care medicine. Now, more than ever before, I realize the need for medical service in underserved populations, especially at international sited. I also appreciate the human aspect of medicine more rather than focusing on the science aspect. Medical students who work in under-resourced areas around the world show a greater interest in primary care medicine upon their return to the United States. To access the application for GHI funding, please click here.